Today it is cloudy, windy, and rainy, so I decided that it would be a good day to make chili. For sides I am thinking about having cornbread or baking powder biscuits and coleslaw. I got a horrible head cold and my sinuses have been throbbing for 2 days, so it's chicken and rice soup, a hot bath and warm compresses across my eyes and forehead. Sorry to hear you're not feeling well. Hope that chicken soup does the trick and you're up and around soon! Spent a large part of the day running around and discovered I was quite tired when I arrived home. Even took a bit of a nap in the recliner late in the afternoon, so I was feeling lazy. I warmed up some leftover split pea soup and had a few oatmeal-raisin-nut cookies that I baked this afternoon. Kim pulled some smoked ribs out of the freezer, and with that we're having instant brown rice cooked with chicken broth, and canned mixed stir-fry vegetables added after the rice is done. 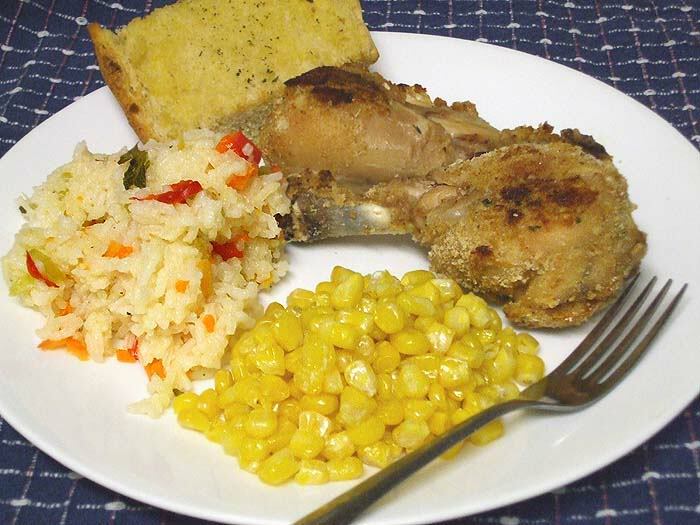 I'm making Mark breaded, baked chicken legs, Baked Rice Pilaf Recipe : Recipezaar, corn and garlic bread. When I'm done with all that, I'm going to finally have a fish taco. P.s., after action report, we had a lovely evening. Sat and talked and enjoyed her soup, and sat and talked some more after it. What a great time. Last night my bf had a serious craving for Chinese food. I don't like Chinese food so I don't blame him for his insane craving, considering he rather eats it.